Golden rice burst on a world ready and eager for a new beginning. Announced with a flourish in January 2000, it promised to save millions of people from blindness and disease. It can certainly help to improve nutrition and health in many developing countries. But, as the publicists' dust settled, it became clear that golden rice was never going to be a silver bullet. It is a genetically modified (GM) strain of rice that has been engineered to produce beta-carotene. That not only gives it its eponymous golden colour, but enables people eating it to produce vitamin A. The World Health Organisation estimates about 250 million people globally are deficient in vitamin A, increasing their risk of blindness, immune problems and other serious conditions. So golden rice sounded like a real answer to a genuine problem, especially since the biotech company responsible, Zeneca, said it would offer the seeds freely to farmers in poor countries. The reality, though, appears a little more prosaic. For a start, the genes for beta-carotene are already present in conventional rice. It is just that they do not work as well in the "natural" varieties as in the novel version. Beyond that though, poorly-fed people are unlikely to be able to absorb beta-carotene even when they eat golden rice. To use it, they need a diverse diet, including green leafy vegetables. But the sorts of vegetables people used to be able to find have declined in number as the green revolution of the 60s and 70s emphasised monocultures of new varieties. Household consumption of vegetables in India has fallen by 12% in two decades. The prospects for golden rice receded a little further in 2002, when scientists published the draft sequences of the rice genome. That promised quicker results from conventional plant breeding, partly because it established where the beta-carotene "pathway" sat in the rice code. A scientist from the biotech company Syngenta, which now includes Zeneca, said: "All the genes are present in rice. 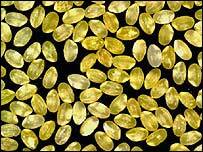 One could make a non-GM vitamin-A rice simply by studying those genes in a more focused way." Golden rice may prove part of the answer to vitamin A deficiency, though not the comprehensive solution it seemed to be. But it would be an answer that came with a hefty price-tag: the persistent concerns about the safety of GM technology to human health and to wild species. Golden rice looks like being a special case, anyway, because the biotech industry is unlikely to give poor farmers free access to all its inventions. People who campaign against GM crops are sometimes accused of wanting to deny the wretched of the Earth the chance to escape poverty and disease, all in the name of their own ideological obsession. But some impressive figures echo their concerns. Dr Richard Horton, editor of the British medical journal The Lancet, said: "Seeking a technological food fix for world hunger may be... the most commercially malevolent wild goose chase of the new century." And from the biotech industry itself, Steve Smith, who worked for Syngenta Seeds before his death in June 2003, said: "If anyone tells you that GM is going to feed the world, tell them that it is not... To feed the world takes political and financial will - it's not about production and distribution." Every day 800 million people go to bed with empty stomachs. Every day more than 30,000 under-fives die, from easily prevented diseases or from hunger. 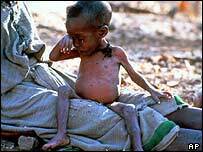 The world is out of joint, and it will stay that way until those of us who are well-fed care enough to wage a war on hunger as ferocious as that against terrorism. Science, perhaps including GM technology, can provide the weapons for that war - but that won't ever be a silver bullet.